Can you tell I love spring? 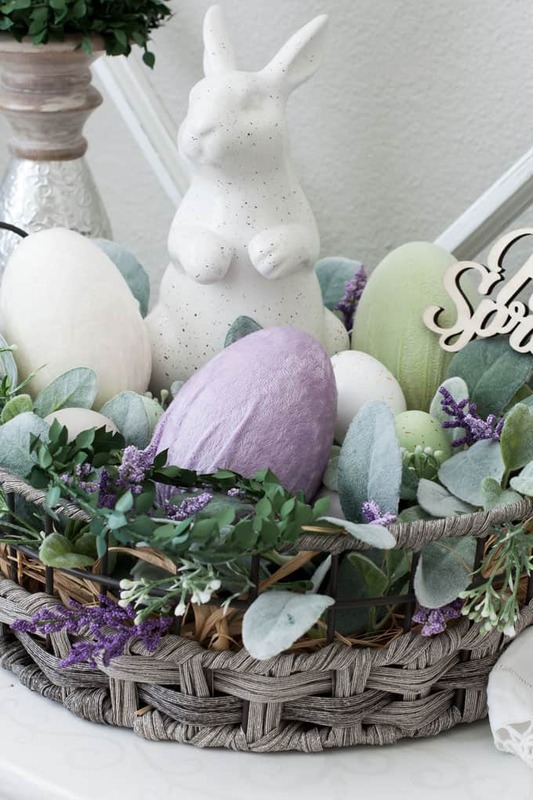 Preparing our homes for the season is so fun, and today you get to see some spring decorating ideas with velvet Easter eggs. Before we start looking at some fun ideas for spring decorating, I wanted to say ‘thank you’ to y’all. The reason this blog is still kickin’ after just over a year is because of you. Getting to know you, seeing your comments, and learning with you makes for many fun days! Thank you for being such a HUGE part of this blog! Now, on with the decorating! If you’ve been following My Wee Abode for a while, you know about the Designer DIY Velvet Pumpkins. 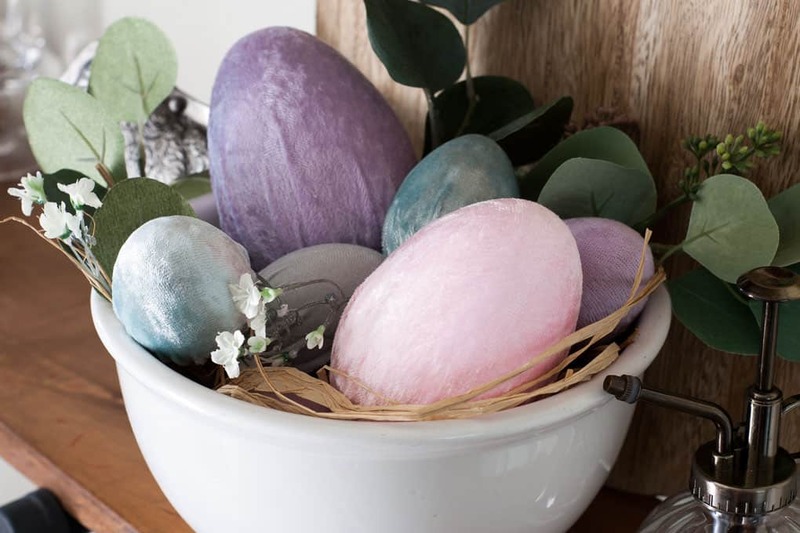 Since those were such a ‘hit’, I decided to create some DIY Velvet Easter Eggs. 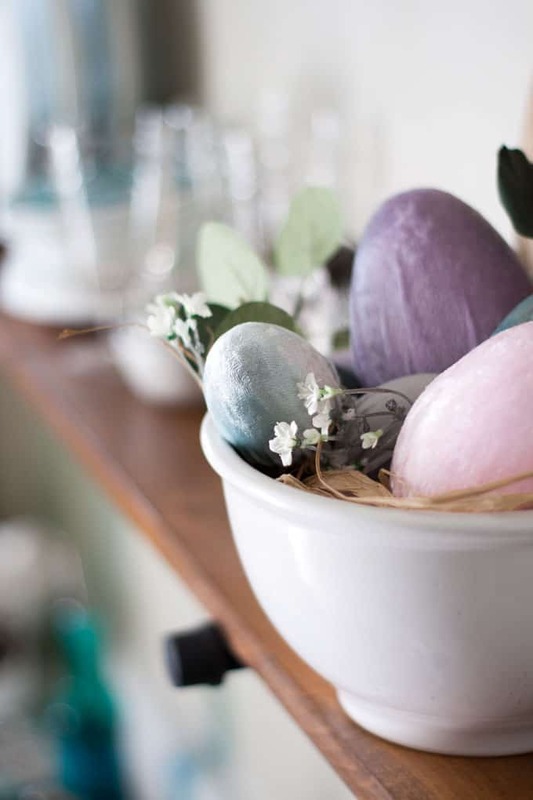 So today, let’s take a look at some different ways to use these velvet covered Easter eggs. 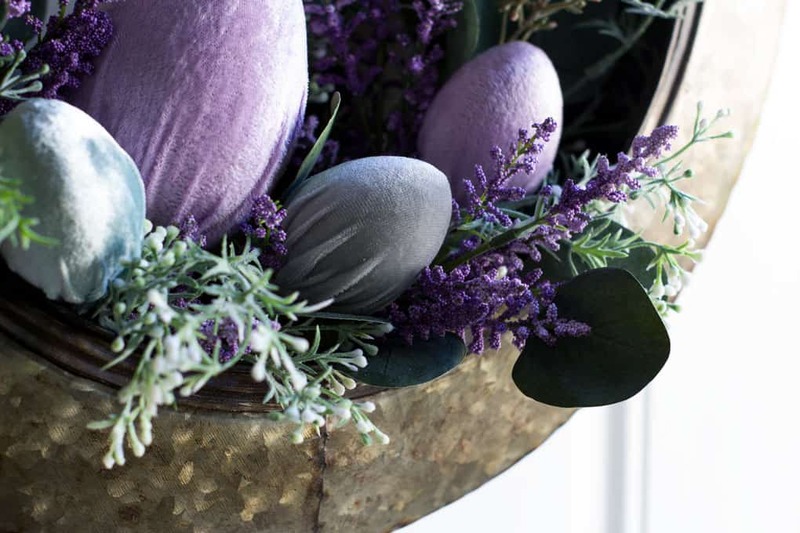 This simple bowl of velvet eggs adds a textural ‘punch’ to an open shelf or hutch. Just nestle two different sizes of pastel colored eggs in a small ironstone bowl. Add a sprig or two of greenery and some tiny flowers and you’re all set! 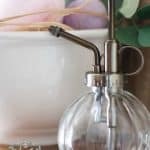 Add a little spritzer bottle to give an added touch of spring. Using several colors of velvet (pink, lavender, aqua, and grey) in two different textures adds some interest to the collection. 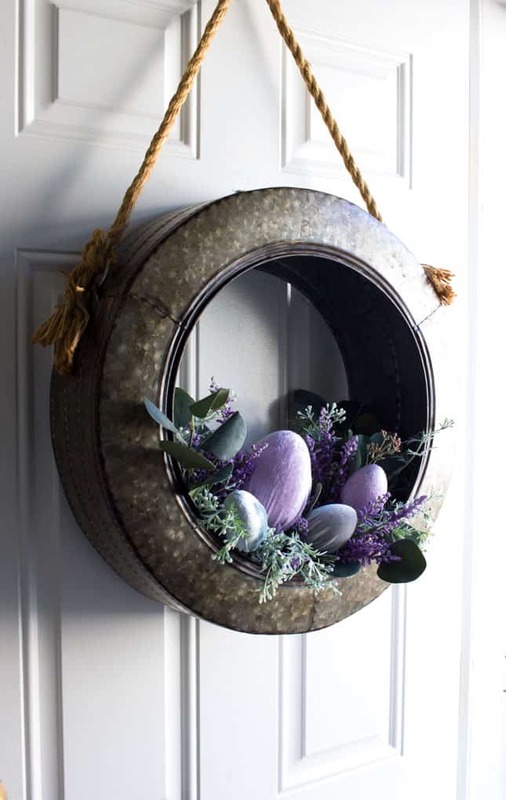 This Unique Spring Tire Wreath was another popular diy project last year. So this year, it got a makeover! 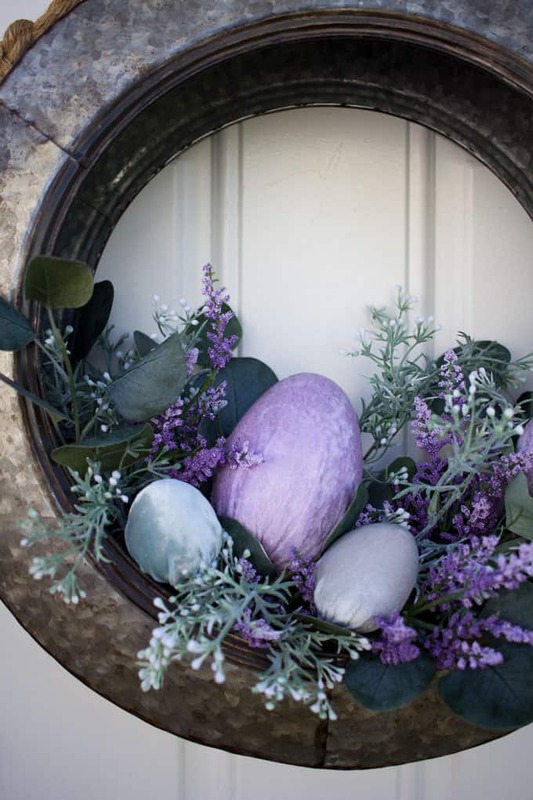 Don’t you just love the velvet covered eggs with the lavender and white florals? And eucalyptus branches add just a touch of farmhouse, too! Here is a full view of the spring tire wreath. 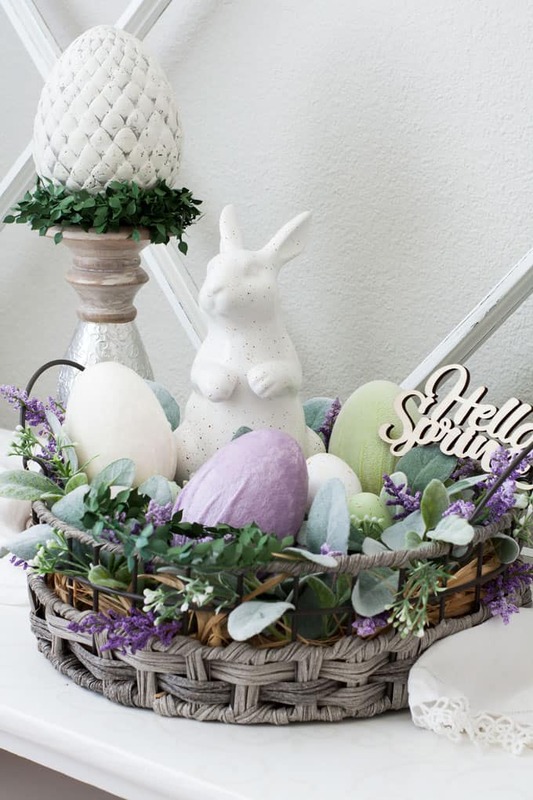 There is a full post on how to create this Spring Centerpiece, which you can use as a vignette, too. As a matter of fact, I’m showing the vignette here again, but I changed two things. Can you spot the changes? I couldn’t find the lavender velvet on my first shopping trip. I was tickled purple (see what I did there?) that I found it at another fabric store on my second outing. The changes make me happy-sigh. 😉 I really like the ‘tighter’ color palette. Can you tell I’m really diggin’ lavender and green this spring season? This is one of my favorite ideas. 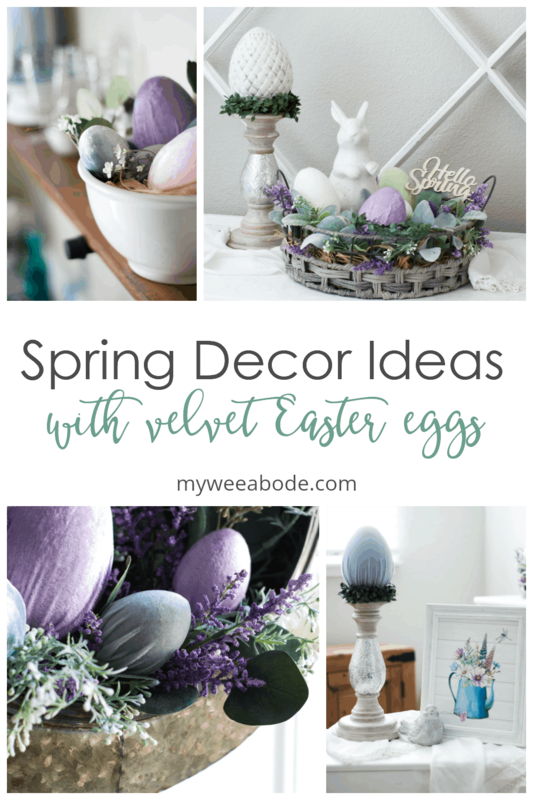 You can use large velvet covered eggs on candle holders! Add a little wreath around the base to steady the egg and you’re done! 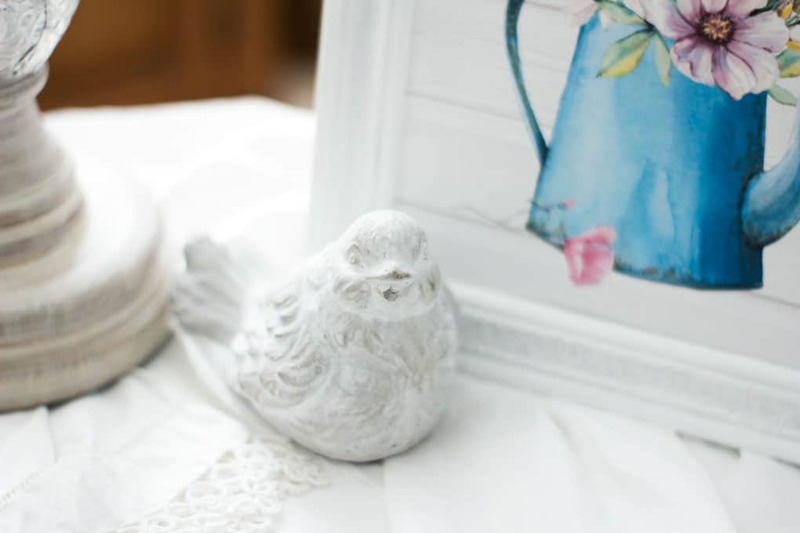 Okay… I know this has nothing to do with the velvet eggs, but isn’t this little birdie so cute? 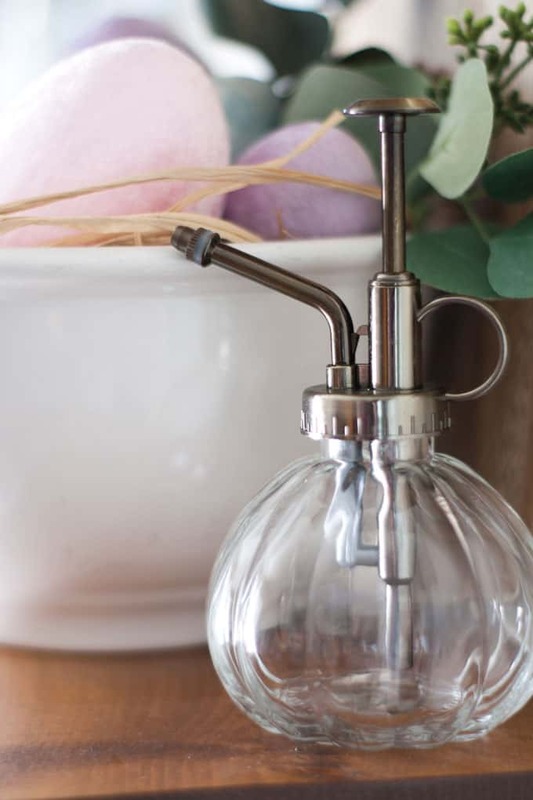 The large egg on the candle holder is makes such an impact, don’t you think? 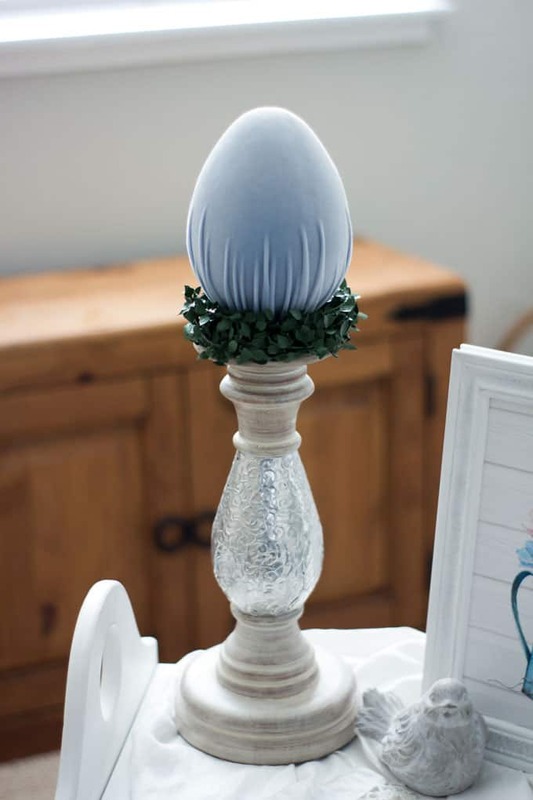 The velvet egg is a six-inch paper mache egg form with pastel blue stretch velvet. 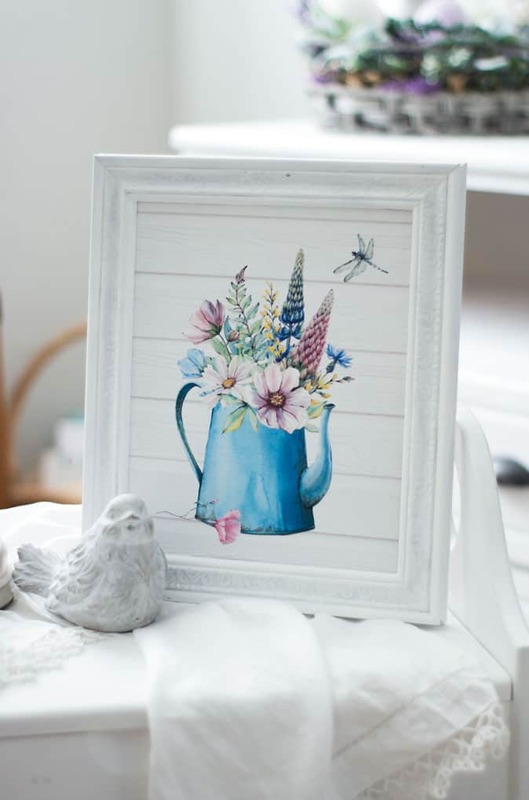 Oh.. You want to know where to get this watering can printable? That’s easy! And there are more where this came from, too! Click HERE! 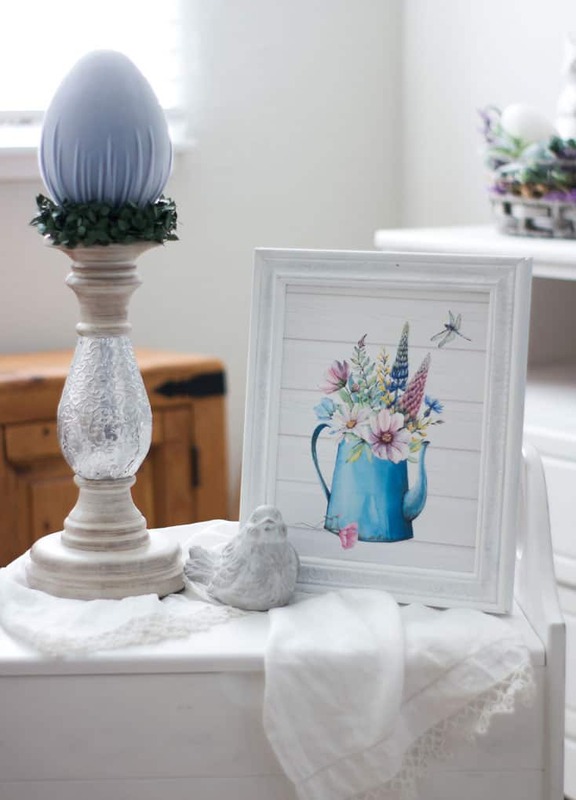 Such a sweet little vignette… perfect for a side table in any size home whether it’s small home, apartment, large home, or dorm room! I actually have ONE more project I’m hoping to get done with these little spring lovelies! Stay tuned! 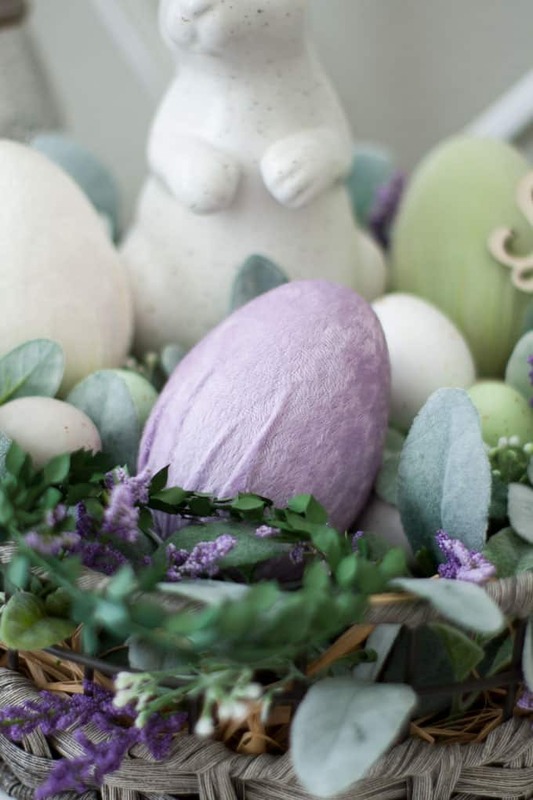 I love your velvet eggs Julie….and you are right, the lavender is so pretty. I had to laugh at the thought of you hanging over the outside railing because for some reason, I thought you were upstairs….and if so, it could be a bit dangerous which would be no laughing matter. The tire wreath is so clever and I’m sure it is light weight which would make decorating it so easy. Thanks for your tips. Thanks, Kari! I’m glad you laughed… I love when I can give a smile by sharing my ridiculous antics. LOL! Yes, the tire is quite light weight! Everything is gorgeous! I especially love the wreath! So beautiful! Great job my friend! Thanks, Malan! You are a wonderful friend and encouragement! Hugs! I have seen your velvet Easter eggs EVERYWHERE!!!!!! So happy for you and your amazing project! Thank you, KariAnne! You are an amazing cheerleader and support! Hugs! Everything you do is always so elegant! Thanks for making this so easy, even for me! Thanks, T. It’s fun putting everything together, that’s for sure! Love ya! 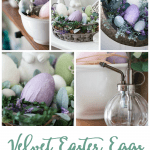 Your velvet eggs are adorable and I love your watering can printable! Thank you, sweet Lauren. I’m glad you like them! Love the velvet decorating ideas. I’m a fan of the candlestick and wreath idea, as you know! 😉 You’ve done a great job coordinating your eggs and printables in various ways. Pinning and sharing on FB! Thank you, sweet friend! Yes, we are partial to candlesticks. Hehe! So many beautiful ways, they’re almost endless! I really love that wreath, although I’m obsessed with wreaths. Wreaths are always fun, aren’t they? Thanks for the kind words, Carrie! Hugs! Julie, what a lovely idea! I have some material I can use in my stash to make my own velvet eggs. Pinned! I love velvet and your eggs look fabulous. You choose just the right colours. Thanks, Claire! I appreciate your sweet words! Hugs! Very cute as always, Julie! 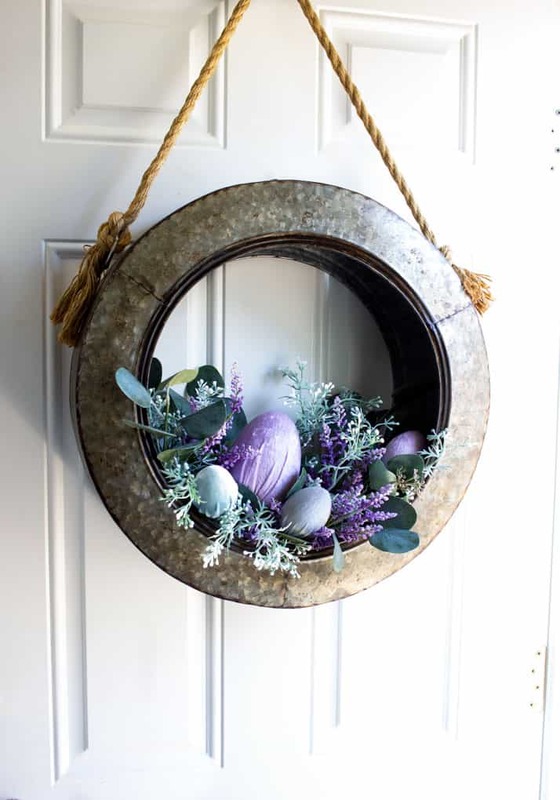 That tire wreath is always my favorite, love how you’ve used the eggs in it this time! Thanks, Tiffany. That tire wreath is a fave of mine, too! Hugs! Ahhh, it’s all so pretty! I love the colors and the texture! Thanks for sharing these lovelies at Thursday Favorite Things, Julie!